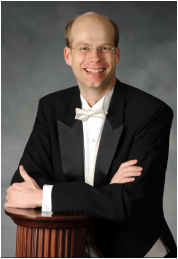 German-born concert organist Dr. Jens Korndörfer has spent the last twelve years in France, Japan, the United States and Canada. His multinational experience has enabled him to become intimately familiar with a wide range of different cultures, instruments and musical styles, allowing him to be equally at home in the interpretation of music by composers as different as Bach and Messiaen, Couperin and Reger, Franck and Ives. Additionally, he enjoys including transcriptions of orchestral, instrumental, and even film music in his programs, in order to bring new listeners to the pipe organ. ​Dr. Korndörfer has performed to critical acclaim at many prestigious venues, including Westminster Abbey in London, Notre Dame Cathedral and St. Sulpice in Paris, Chapel Royal in Versailles, Moscow Cathedral, Kaiser-Wilhelm-Gedächtniskirche in Berlin, the Münster in Ulm, St. Thomas Church Fifth Avenue in New York, Cathedral-Basilica in St. Louis, St. James Cathedral in Toronto, Suntory Hall and Metropolitan Art Space in Tokyo, Kyoto Concert Hall, and Cultural Centre in Hong Kong.